After many years of designing and testing racing oil systems and related components, Moroso has determined what's most important to oil filtration. 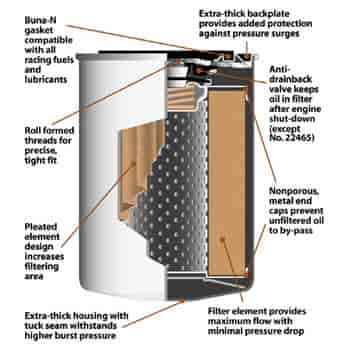 Many oil filter manufactures stress the importance of filtering the smallest particles out of your engine's oil, with reference to "micron ratings" of 10 or less for a filter's efficiency. With the help of research performed by filtration technology experts, Moroso engineers have determined that particles smaller than 20 microns in diameter are not large enough to produce engine wear. Furthermore, Moroso has found that filters with extremely low micron ratings can create an excessive pressure drop across the filter. They can be so restrictive that the filter by-pass valve can open. With the by-bass valve open, unknown to you - NO FILTRATION will occur! To maximize filter performance, Moroso Racing Oil Filters have a rating of 27 microns, which produces a maximum initial restriction of only 2.5 psi when tested to SAE j806! The result is less pressure drop, more flow, less oil by-pass and maximum filtration performance important in severe racing conditions.